I saw something on Pinterest indicating that this simple “formula of freshness” is a cleanse, so here’s a photo of it and we will see if I notice anything different! 🙂 Strictly from an aesthetic perspective, I do love the yellows and greens from different organic sources. The colors I have been gravitating to for projects lately (as you will see in an upcoming post) have been these bright and springy colors, obviously here inspired by nature. I think this trend is backed with hopes for spring to come quickly and drive the biting cold away! 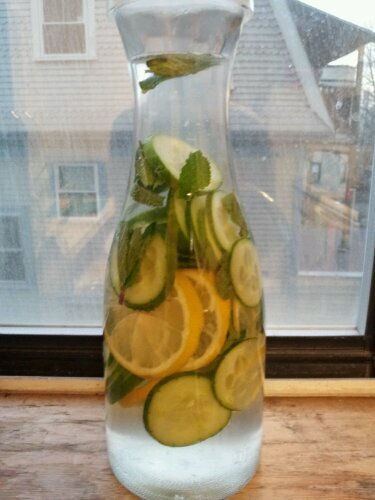 Ingredients of this beauty : Water, half a lemon (sliced), half a cucumber (sliced), leaves from four sprigs of mint. If anything, at least this mix should taste good. Perhaps with a teeensy bit of sugar. Enjoy! Tags: cleanse, cucumber, feel good, food and drink, fresh drinks, healthy, lemon, mint, pretty fresh colors, yellow and green. Bookmark the permalink. Previous post ← Wall or Walkway?